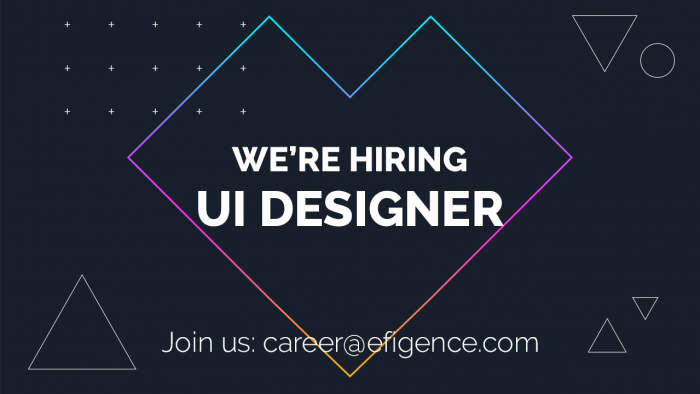 Efigence, a technology company specializing in the design and implementation of both off-the-shelf products and bespoke development for financial services, is looking for a UI Designer with a minimum of 2 years of experience in web and mobile interface designing. • Portfolio confirming experience in the design of interfaces and interactions. • Skills of active cooperation with the UX designer. • Proficiency in using contemporary design tools: Sketch, InVision, Zeplin, additionally Principle, Abstract etc. • The ability to start cooperation quickly will be the big advantage. • The possibility of rapid development thanks to participation in large, innovative projects, including from the financial and telecommunications industries. • Work in an experienced team of UI and UX designers. • Attractive salary adequate to skills and responsibility. • Full-time job in the company’s office with the possibility of home office. • A modern workplace – our office is getting a complex redesign! * Please note that we will only contact candidates selected for interview. I agree to the processing of my personal data contained in this CV and other application documents by Efigence S.A., headquartered at ul. Wołoska 9a, 02-583 Warsaw, as a data controller in order to carry out the current recruitment process. I agree to the processing of my personal data contained in this CV and other application documents by Efigence S.A., headquartered at ul. Wołoska 9a, 02-583 Warsaw, as a data controller for the implementation of future recruitment processes, carried out within 12 months of the date of submitting application documents. Granting consent is voluntary, but it is necessary for participation in the recruitment processes conducted by Efigence. The consent may be withdrawn at any time (by sending a statement to the e-mail address: kontakt@efigence.com, by mail to: Efigence S.A., Wołoska 9a, 02-583 Warsaw, or by phone: 22 380 13 13). The administrator of your personal data is Efigence S.A. Data is collected for the needs of the current recruitment, and in the case of explicit and freely granted consent, also for the needs of future recruitment.